My daughter loves Easter. 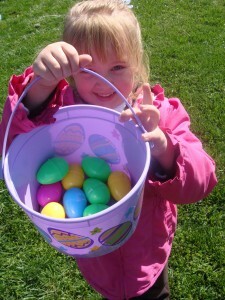 One of her favorite things about the holiday is going on egg hunts. 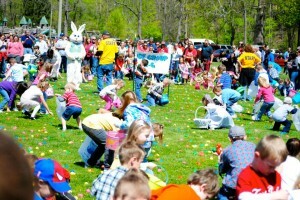 I have found several family Easter events in Hendricks County, Indiana, this year. All of the following activities take place on Saturday, March 30, 2013, and the best part, they are free and open to both residents and visitors alike. Washington Township Community Park Easter Egg Hunt – 10:30-11 a.m., March 30 The Avon Optimist Club invites kids to an Easter Egg Hunt at Washington Township Park in Avon. The hunt will begin at 10:30 a.m. and will be held in the upper level of the park. Arbuckle Acres Easter Egg Hunt – 9:30 a.m., March 30 Grab your baskets and head to Arbuckle Acres in Brownsburg to meet the Easter Bunny and go on an egg hunt. The Easter Bunny will arrive at 9:30 a.m. for pictures. The egg hunt will begin at 11 a.m. Areas of the park will be divided into age categories with various groupings from infant all the way up to age 12. The eggs will be filled with candy and prizes. Ellis Park Easter Egg Hunt & Rubber Duck Race - 1:30 p.m., March 30 The Kiwanis Club of Danville hosts an Easter Egg Hunt and Duck Race at Ellis Park. Head to the Train Station at Ellis Park for pictures with the Easter Bunny before the hunt begins. The Easter Bunny will be available for pictures at 1:30 p.m. and the hunt will begin at 2 p.m. Kids will be split into three age categories: ages 2-3, 4-6 and 7-9. After the hunt, stick around for the Duck Race in the creek. If you want to participate in the duck race, you need to buy a duck in advance and decorate it. Ducks may be purchased for $1 at the Danville Parks & Recreation Center. Prizes are awarded for the best-decorated duck and for the first duck to make it under the second bridge over the creek. Egg-stravaganza at McCloud Nature Park – 1-4 p.m., March 30 Looking for something different from an egg hunt? Head to North Salem for the Egg-stravaganza at McCloud Nature Park from 1-4 p.m. The event starts off with a hop-along hike on Prairie View Trail with a naturalist in search of cotton-tail rabbits. You can also take a self-led hike on Red-Tailed Ridge to search for hidden eggs along the trail, and these aren’t ordinary eggs. Each egg will have facts about animals, and you do not take the eggs with you. After finding all the eggs and learning about animals, head back to the Nature Center to learn about natural alternatives to dyes and create a springtime bouquet out of recycled egg cartons. Hummel Park Easter Egg Hunt - 9:45-11 a.m., March 30 The last two years, I have taken my daughter to the Easter Egg Hunt at Hummel Park. We enjoy this hunt because the children are divided into age groups and each group has their own area to hunt. In addition to getting candy-filled eggs, my daughter loves that this hunt also has a bounce house. 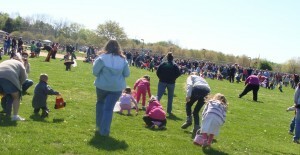 The Easter Bunny arrives at 9:45 a.m. with the hunts beginning at 10 a.m. Hunts start every 10 minutes. Splash Island Underwater Easter Egg Hunt & Pictures with the Easter Bunny - Noon-2 p.m., March 30 Take egg hunting to a new level as the Plainfield Parks Department invites children to Splash Island for an underwater hunt in their indoor pool, 651 Vestal Road, Plainfield. Radio Disney is hosting the water activities from 1-2 p.m., and admission is free. 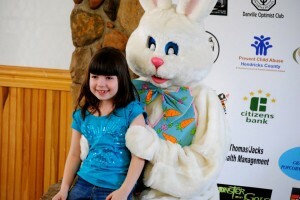 Before kids get in the water, they can get their pictures taken with the Easter Bunny from noon-1 p.m.